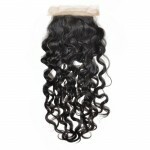 These extensions are made of human, all natural hair and they are high in quality. Brazilian hair extensions can be cut to a desired length and dyed to match your natural or dyed hair and highlights. It’s possible to use curlers, curling irons, flat irons and other heated styling products on them. You can wash, condition and dry these extensions with your regular shampoo and conditioner. I prefer Argan oil for maintaining their beauty. They look authentic, shiny and healthy. Once you learn how to apply these extensions properly, you’ll see that it’s simple to loop or clip them into your own hair. The price. Natural Brazilian hair extensions are a little bit expensive and you need at least 3 pieces for the desired look, depending on your hair’s thickness, length and texture. Buying wholesale Brazilian hair might be a better idea. If you place it incorrectly, Brazilian hair might be noticeable and gaudy. Therefore, it would be wise to have professional hairdresser assist you with clipping it for the first time and teach you how to do that on your own. Yes, this means you need some extra money for the salon assistance. On extremely hot summer days, Brazilian hair (as any other hair) might feel a little bit uncomfortable and heavy. Final verdict: If you have your mind set on buying human hair extensions, the advantages of virgin Brazilian human hair extensions outweigh the disadvantages. They look natural and can give you versatility to your formal and everyday looks. But, be aware of this: once you try natural hair extensions, you’ll never go back to the synthetic ones again.